Our long-term goal for Agape Children’s Village is to get them back on their own two feet. We want the orphanage to be self-sustaining. With the help of generous donors, we have brought several sewing machines to ACV, so that the mothers can begin selling clothing and other sewn goods. Also, the James family will help teach the mothers and children other trades, like gardening and raising animals. They will teach them how to be wise with the money and resources that God gives to them. Not only will they be able to sell foods and meat, but they will be able to live off of their own crops and animals. This will save the orphanage a lot of money in the long run. Ultimately, we want ACV to be able to function well and survive on its own. We are honored to be used by God to help this orphanage, but we do not want to become a permanent crutch that keeps them from learning basic survival skills. We want the children to be equipped for the world as they grow up and go out. Our vision is to equip ACV to be all that God wants them to be. Embrace Uganda and Agape Baptist Church continue to play a major role in the vision at ACV! 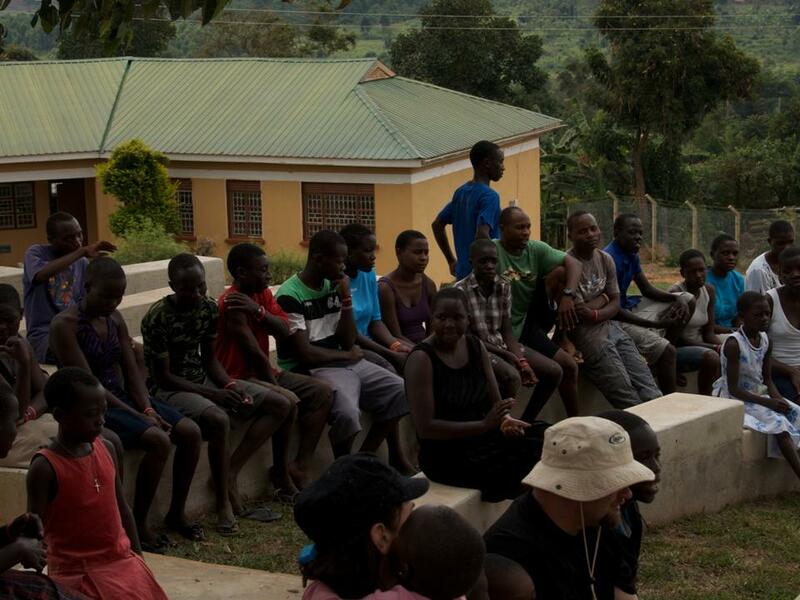 Embrace Uganda has a team on the ground in Uganda that assists in many ways. They pay school fees, visit the children and help out wherever needed. Agape Baptist Church played a major role in getting ACV started and continues to play a major role in the daily operations at ACV by providing leadership and spiritual guidance. Additionally, we knew that God was leading us to make our trips to Uganda more regular. Since the summer of 2010, we have taken a trip back about every six months. Thus far, we take teams in January and July. To us, sending money is a great gesture. It is a way God is choosing to use our resources, but we don’t feel that it is enough. The people and the children in Uganda desperately need financial resources, but they have a much greater need for love. Money only goes so far, but the love of Christ is endless. We know that one of the best ways to show them that love is by regularly visiting them. Many people come and go to places like Uganda. They see the needs, they fulfill them, and then they leave. Even at ACV, many mission teams have made a visit or two. What makes us different is that we keep going back. We want the children to know that they are special to us. We came up with the acronym H.O.P.E., which stands for Helping Orphans Pursue Elpida. Elpida, pronounced el-PEE-tha, is the feminine form of the Greek word for hope. In Scripture, hope is an indication of certainty. “Hope” in the Bible means “a strong and confident expectation.” Though often misused today, true hope is similar to trusting and to confidently expecting. By its very nature, hope stresses two things: futurity, and invisibility. It deals with things we can’t see or haven’t received or both. Our vision is to give the people and children of Uganda the hope of eternal life, something they can neither see nor have already received. Hope is what gets them through every day. Hope is what they need, not just money. Even food only satisfies the body but for a moment. The hope we have in Christ sustains the soul forever. Hope is a far-away mountain that can only be seen through the lenses of God’s unending love. This is why we sacrifice our time and resources to help these children. We want them to know the love of God, so that they may see that there is true hope for them, elpida. As you feel the Holy Spirit tugging at your heart to get involved, we humbly ask that you would join us as we Help Orphans Pursue Elpida. We can definitely use your prayers and encouragement. If you feel called to help support ACV financially in any way, go to the donate tab or contact one of our churches for more information. Be blessed as you go about your busy lives, and please share the hope of Christ with someone else today.